Last night, our diamond ring made it's Nashville appearance! Here's a quick run down on how it happened! 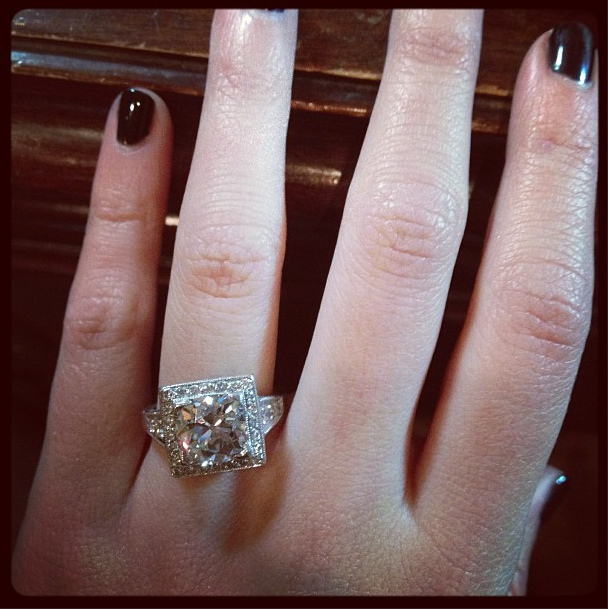 : Teddy Conrad proposed to Peggy Kenter to avoid a possible scandal since she is pregnant with Teddy's child! However, unbeknownst to Teddy, Peggy miscarried and is no longer pregnant! Dun, dun, dun!!! Tune in on Wednesday nights at 9 pm on ABC to catch the newest episodes and to spot more gorgeous jewels from Walton's! Teddy Conrad, played by Eric Close, proposing to Peggy Kenter, played by Kimberly Williams-Paisley, with the Walton's diamond engagement ring! The Walton's diamond ring worn around Peggy's neck while she and Teddy attempted to keep their engagement a secret. Season two of "Nashville" premiers September 25th, which means more airtime for Walton's! The upcoming season promises to be more intense than the first, involving more romantic twists and music drama! Tommy Tomlinson, the Props Designer for "Nashville", has been working with us to promote and showcase more stunning jewelry from our store in the upcoming episodes of "Nashville". The picture below shows our Walton's logo displayed on set in the bar of the Bluebird Café, a venue that plays a key role in the show. Be sure to check out "Nashville" and look for our logo and pieces of our gorgeous jewelry!